Sweat bees are a small native bee to North America. They can be found all throughout the world, except Australia and Southeast Asia. 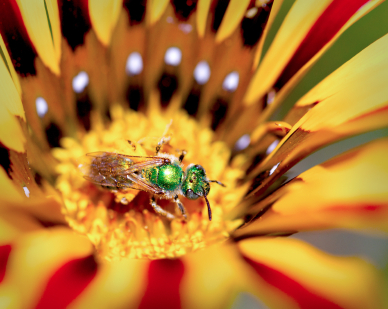 Most sweat bees can be recognized by their metallic green, red, or yellow color. Some can also be just a plain black or brownish color. Although, they have a cool, intense appearance, sweat bees are docile and generally won’t sting unless handled. Sweat bees get their name from their strong liking for human perspiration. The human diet produces a salty sweat that the bees can acquire essential nutrients from. These bees nest mainly in the ground, but some will also nest in rotten wood. Sweat bees are solitary bees, but have been known to work together and share the entrance to their tunnels. After the main tunnel has been dug, the bees will then branch off into their individual homes. Females will deposit balls of nectar and pollen in which to lay their larvae in; this will nourish the larvae. Then after spring arrives new adult bees will emerge.